Can California Save Itself From A Pension Disaster? The California Public Employees’ Retirement System (CalPERS) and other pension systems in the Golden State might be celebrating their recent investment returns, but don’t be fooled. Their problems are nowhere close to solved — and those problems are taxpayers’ problems. Unfunded pension liabilities continue to represent a colossal fiscal burden for both the state government and local governments within California. They’re the reason that taxes are higher than ever, crowding out the services that the state and cities deliver. At the state level, pension contributions have grown from 2.1% of the budget in 2002–2003 to 6.5% in 2016–2017. They’re set to grow even more in the current fiscal year and into the future. Cities such as Los Angeles and San Jose are now contributing well over 10% of their budgets to pensions, and CalPERS is charging smaller cities amounts that are north of 15% of their general fund revenue. At the same time as all these contribution hikes, the stock market has roared to record highs. Investors that participated in the S&P 500 since the end of 2002 would have started 2018 with a four-times return on their money, or around 10.5% per year. So of course, with all this extra contribution money and massive windfalls from the stock market, the pension funds must now be in pretty good shape, right? Take CalPERS, for example. At the end of FY 2002 it had a (mere) $22 billion unfunded liability when assets are valued on a market basis. As of the last full report for FY 2016, its reported unfunded liability was $139 billion. Even with the stock market’s burst upward in 2017 and early 2018, the unfunded liability would currently be around $110 billion. More bad news: the situation is only that “good” if CalPERS can achieve its 7% return target forever, as it and other pension funds, such as the California State Teachers’ Retirement System (CalSTRS), assume will happen with certainty every year when they craft their budgets. Maybe they will achieve those returns, but maybe they won’t. Combining all the pension funds in California and recalculating their liabilities based on the principles of finance, as opposed to governmental accounting magic, I find that the collective debts that California taxpayers owe public pension funds is $769 billion — over $60,000 per California household. If things have gotten so bad during a time when the stock market was rocketing forward and municipal governments were shoveling piles of cash into pension funds at the expense of bridges, roads, and libraries, what’s going to happen when financial markets inevitably cool off? California cities risk insolvency, and the crisis threatens the state’s ability to deliver on key budgetary priorities. California Governor Jerry Brown knows that pensions are a problem. In 2011, the first year of his second turn as governor, he proposed a 12-point pension overhaul. The California State Legislature passed some of these points, particularly those that affect new hires. These new members of the workforce will face higher retirement ages, and there will be more sharing of costs between them and their municipal employers. Unfortunately, the true pension costs are far higher than the costs as reflected in current budgets, which is the part that would be shared. It’s like my committing to share costs with you in advance of your taking me out to dinner at a very fine restaurant — but my contribution is only based on the expected cost of a hamburger at a fast-food joint. The bulk of the true costs only shows up later when the actual bill arrives. In the time that it takes even those minimal savings to be realized (remember, these changes are only for new hires), pensions will wreak considerably more havoc on the budget. Other points in Gov. Brown’s plan were passed but are currently being litigated, such as the limitations against pension spiking—the practice under which some public employees artificially inflate compensation in the years before retirement in order to set themselves up for a higher lifetime payment on the taxpayer dime. Believe it or not, many public employees assert that they have a right to such practices. They contend that the body of precedent informally called the California Rule gives public employees a right to whatever benefit was available to them on their initial day of employment, including the right to manipulate the compensation that determines their lifetime pension benefit. Recent appeals court decisions have upheld employees’ right to spike, but the California Supreme Court has taken up the issue. Gov. Brown is now staking his reputation on what he called his “hunch” that the Supreme Court will agree with him and stop the odious practice of spiking. Furthermore, he is hoping that this will open the floodgates to allow the governor in the next recession to “have the option of considering pension cutbacks for the first time.” The Supreme Court may or may not eliminate spiking, but wagering that their decision will be broad enough to allow more general cutbacks–or eliminate the California Rule entirely–is certainly optimistic thinking. Gov. Brown can rightly say that the legislature didn’t do everything he proposed, including the introduction of a hybrid plan (for new employees) that would mix a 401(k)-type component with a defined benefit component. Indeed, this approach was taken by the federal government for its workers in 1986. And while federal pension legacy liabilities have continued to balloon, the newer part of the program is reasonably well funded. There’s a big difference though: the federal plan uses a 5.25% budgeting rate—still high, but not as insane as the 7% rate to which CalPERS and CalSTRS are desperately clinging. As a result, Gov. Brown’s hybrid plan would at best have had the effect of slightly reducing the explosive rate of growth of new unfunded liabilities for new employees. State and local governments simply refuse to recognize the true cost of providing annuity benefits to workers. 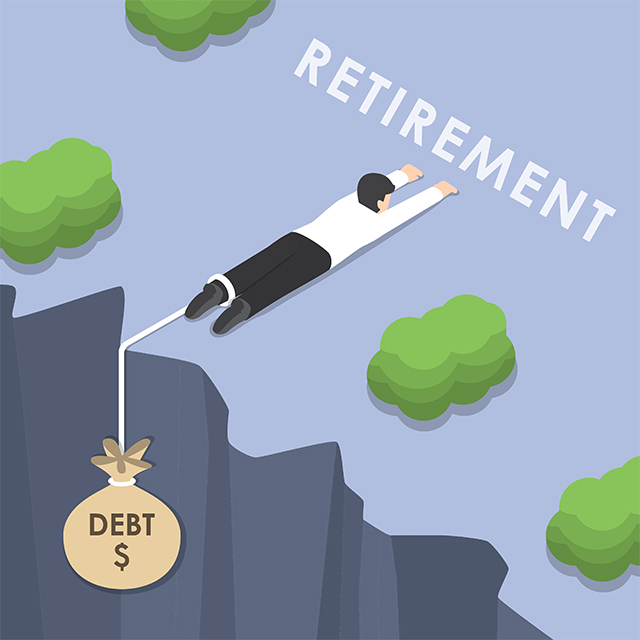 Giving employees pensions is akin to promising them payments from government bonds. And while one can fund those with risky assets and hope for the best, that strategy destabilizes public finances. The debts keep growing as the bills come due. Some states and cities have considered the idea of introducing defined contribution 401(k) plans, as US companies have done in large number. According to one study, 24% of Fortune 500 companies started bringing new employees into 401(k) plans instead of traditional pensions between 1998 and 2015, and 39% had “hard frozen” their plans. In a hard freeze, no earned pension benefits are taken away, but employees earn no new pension rights in the future and instead receive contributions to a 401(k). This practice is commonplace and perfectly legal in the private sector; but under the California Rule, it is a non-starter for public employees. While such transitions may be motivated by a desire to avoid insolvency, they’re beneficial to many types of employees as well. A study last year by authors from a nonprofit partnership focused on changing education and life outcomes for underserved children found that most teachers get a bad deal on pensions because they suffer great financial losses if they change jobs or states. The study concludes that better teachers could be attracted with fewer very expensive traditional pensions that give the longest-tenured teachers the jackpot, and more 401(k)s whose fruits are portable. A better approach to transitioning to 401(k)-type plans would be to entice employees to recognize the benefits of a defined-contribution arrangement by offering more generous contribution rates in those plans than is common in the private sector. The reality is that the great many public employees who are unsure whether they want to follow the lifetime civil servant model would be much better served by a portable 401(k) plan with, say, a substantial 10% annual contribution rate from their employer — a level private-sector employees can only dream of. Real pension reform would recognize that moving away from defined-benefit pensions is essential to rescuing state finances, as well as benefiting many public-sector workers if structured correctly. The state and cities should press the issue with changes that transition from traditional pension plans toward 401(k)-like plans, even if the contribution rates are ultimately more generous than in private sector counterparts. The Federal Thrift Savings Plan, a 401(k)-like defined contribution plan with rock-bottom costs and sensible investment options offered to federal employees, provides a sound governance model. Even at these higher contribution rates, the introduction of well-governed defined-contribution plans would be a vast improvement over the current system. Indeed, such a model is the only one that can save the state of California and its cities from pension disaster. Meanwhile, on the other side of the “Pond,” England is having anything but a jolly old time dealing with its state pension fund. In the nation the state pension age is currently sixty-five for men and sixty-four for women; it is set to equalize this year and to rise to sixty-seven by 2029 and sixty-eight by 2046. According to the Government Actuary’s Department, which uses national insurance contributions to pay state benefits, the fund will reach zero by the 2030s. One solution: would be a 5 percent hike in contributions for workers (for an individual earning £40,000 [about $54,000] the cost would be an extra £190, or $257). Small wonder British workers are less than enthusiastic about their future. According to YouGov research for the Charity Age UK, half of all workers aged forty to sixty-four—about 8 million Brits—don’t expect to have enough money to stop work and retire when they reach their state pension age. One-third expects to be working the same hours well into their sixties. Forget ruling the waves; Brittania rues its finances.